The arrival and development of left-hander Blake Snell in 2016 was a bright spot for the Tampa Bay Rays, who finished in a three-way tie for baseball's second-worst record at 68-94. Called up to make his debut in late April, Snell, 23 at the time, went on to post a 3.54 ERA with 98 strikeouts in 89 innings over 19 starts. He was particularly good after the All-Star break, showing front-of-the-rotation potential that should make him a fixture in the Rays' rotation for years to come. There could soon be a wave of young talent joining Snell in the big leagues, too, as the Rays enter 2017 with MLBPipeline.com's 10th-ranked farm system. 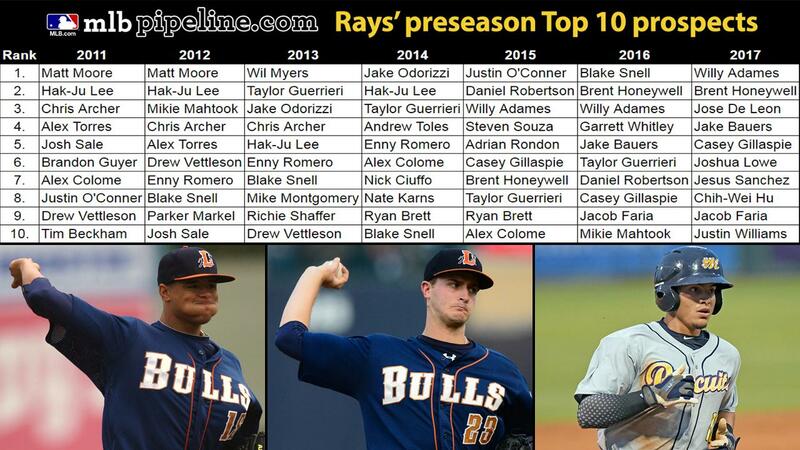 The Rays' system is teeming with players poised to make an impact in the near future, as nine of the club's Top 15 prospects -- and 19 of their Top 30 -- are expected to debut before the end of the 2018 season -- a group that includes four MLBPipeline.com Top 100 prospects in shortstop Willy Adames (No. 21), right-handers Brent Honeywell (No. 31) and Jose De Leon (No. 33), and outfielder/first baseman Jake Bauers (No. 76). The Rays are especially rich in upper-level pitching, with quality depth pieces such as Chih-Wei Hu, Jacob Faria, Jaime Schultz and Christopher Guerrieri all capable of filling a spot in the rotation (or bullpen) on short notice. Meanwhile, that upper-level depth has allowed the Rays' front office to aggressively target young high-ceiling players through the Draft, international markets and trades. The result has been a yearly influx of tooled-up prospects into the system such as Lucius Fox, Austin Franklin, Josh Lowe, Adrian Rondon, Jesus Sanchez and Garrett Whitley, among many. Here are the players whose ranks changed the most from the 2016 preseason list to the 2017 preseason list.